♥!!!! Hello my dear Veronica! Another GREAT outfit, you look gorgeous on that yellow NEON sweater! But I must say I am IN LOVE ♥ with your coat!!!!!!! Love at first sight!!! Glad to see I’m not the only one who can’t get enough of neon…love this look! you always wear very nice boots..
Love the touch of neon…def makes the outfit pop! Gorgeous!I absolutely love this sweater! Love your coat and sweater is amazing!!! It’s a perfect mix of colors. Love it. Nice outfit. Your coat is so lovely. The bright pops of neon are perfect! Neon is always welcome for me, and it looks so great on u especially in the combination with the gray! I love neon with casual neutrals!looks fresh and nice! Gris y amarillo: queda bien! y el toque del bolso, mejor aun! Lovely outfit!! I love the pink clutch so much!! Neon colours look so good on you!! This neon colour is perfect with grey!! Like your outfit! 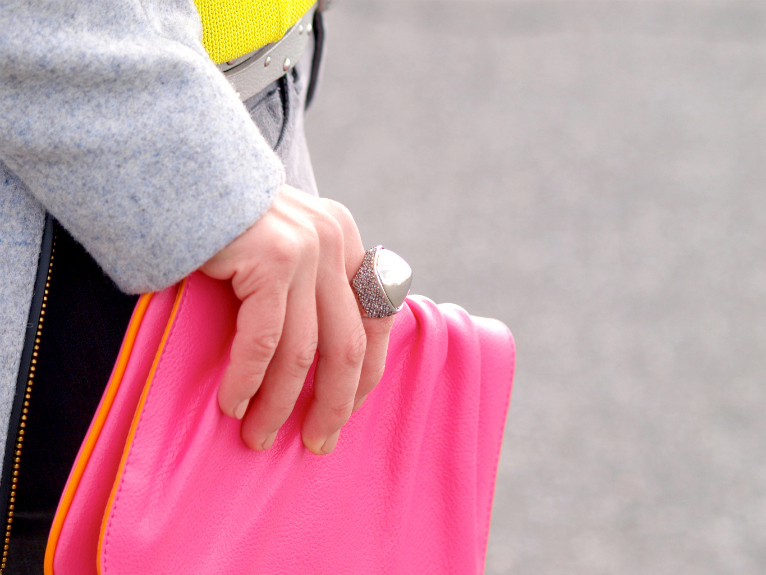 I love neon pink and yellow paired together… it’s very Jenna Lyons! Neon yellow looks incredible with grey!!! Like it! The neon looks so pretty with the subtle grey tones. Really lovely. u are marvelous with colours! the neon yellow & neon pink are so great against the heather grey! You do neon so well!! love ur outfit!! love the colour combination!! Ohh you got that top,I was looking at it today and thinking.Now that I see it styled,amazing! @Borjana I just love this top !!!! thank you ! I love your neon sweater… and it looks great with grey!! I love this outfit. Fantastic!. Kisses. I hate yellow color,I don’t know why, but I like very much your outfit. you look so pretty :)I love how you match the colors – the blazer is really cute and adorable. love the bright yellow, fabulous look! you always have such a great pop of color…love the coat! Don’t you look FABULOUS!!! Love this look! There is no doubt that grey and this neon lemon color just go so well together. I’ve seen this color combination before and I always love it. Great outfit, I love how you belted part of the sweater in. The pop of the yellow is amazing against the grey! Really like that pink clutch, the color combination is so pretty here! beautiful photos and like to the blog!!! Such a fun pop of color!! love this outfit.coat is great. i also love neon color!!! you look fresh and natural with this outfit. Me encanta cmo queda con gris!! The styling is amazing. Love how you matched so bright colors with the calm grey tones. This is inspiring! wonderful look my dear. i’m so in love with this AMAZING coat! Love the bubblegum pink clutch! Yellow always look great on you dear, I´ve noticed it´s probably one of your favourite colours! 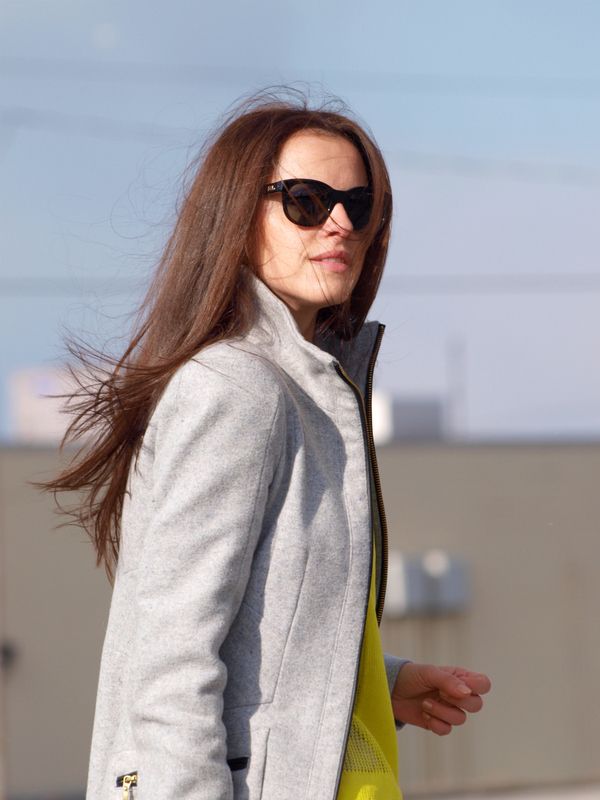 This is a beautiful grey coat and you always have the best colors in your wardrobe! amazing outfit!! in love with your sweater!! oh what a great look darling! i love that neon yellow paired with grey and also your boots are amazing! great outfit love the pops of neon color! I love your blog…Love this outfit! OMG girl! Your hair looks so beautiful! The coat is gorgeous! Nice outfit. I like your blog! You look great, I love the color combo! like so much your outfit, the shoes in particularly!! I am in desperate need of recreating this outfit with my clothes. I absolutely love it! Absolutely love your style, love how you pair you neon sweater and belt so chic. Beautiful pictures. Thanks for comment on my blog !!!. You look awesome my dear. I love the neon top on you. so gorgeous. I stumbled upon your blog and Im in love with your fashion style wow you’re gorgeous !!! I sooo a new follower would like to ask you what camera do you use to take your pictures the colors are so vibrant I feel like Im living in your pictures! I have Olympus E 420 and extra lens 70-300mm. Well,you should wear it more often,it’s very pretty! Love your top, the color is awesome! Veronica, cu femei frumoase ca tine, sunt mandra ca-s romanca. Mai ales zilele astea! You look great! Such an incredible contrast!